Dieter Müller is one of the best known chefs in Germany and his namesake restaurant was next on my list during my stay in Cologne. A three star Michelin restaurant, it is housed in a beautiful Relais & Châteaux Hotel called Schloss Lerbach, which like Gut Lärchenhof, is about 16km from the centre of Cologne. Dieter Müller retired as head chef of the restaurant last year and now only acts as its patron. Into his place has stepped Nils Henkel. For better or for worse, I had no illusions that the restaurant would be the same as when Dieter was there. But it was going to be interesting to discover how the restaurant fared given that the chef whose name upon which the fame of the restaurant was founded is no longer in full time service. 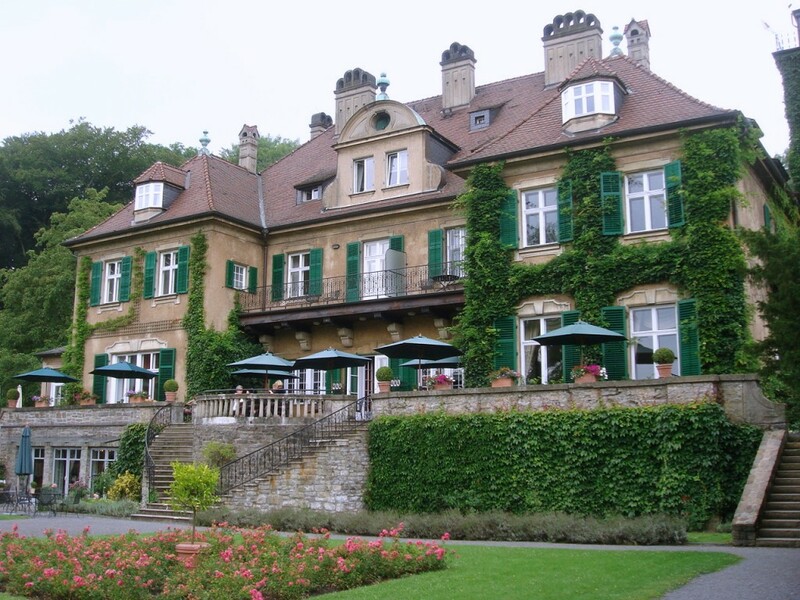 Schloss Lerbach is a beautiful, grandiose building housed in lovely lush grounds. The restaurant itself is a statement in formality. It’s classically elegant, if a little old fashioned, and overlooks the gardens which are made all the more visible by the tall glass windows that line the length of its walls. The windows also serve to let in lots of natural light, which on this nice sunny day made me feel as if I was dining in a garden paradise. Starters range in price from €34 to €48, and mains from €52 to €68. 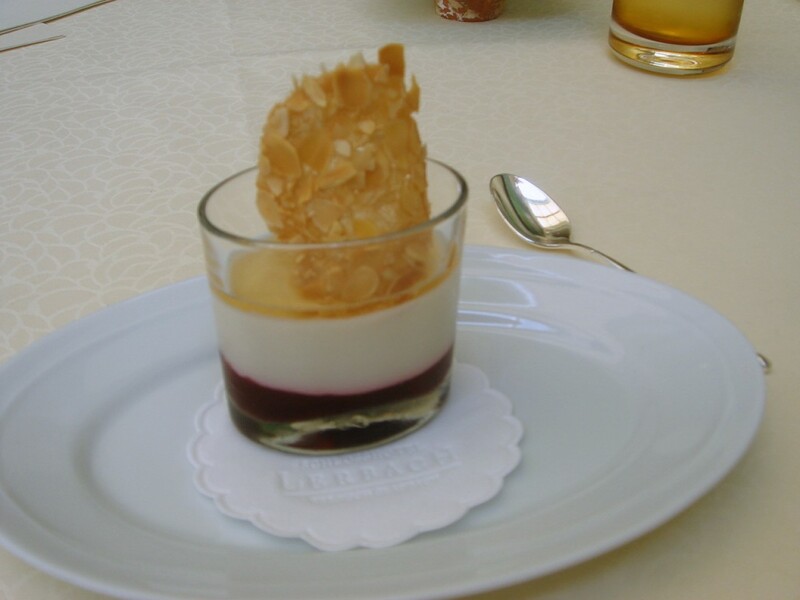 There are also various tasting menus starting from five courses at €135 to seven courses at €170. Also available at lunchtimes are two special lunch menus. One is a €110 menu with five courses (which also includes a glass of champagne, water and coffee), and the other is Dieter Müller’s signature ‘amuse bouche’ menu – 19 different tastings over five courses. 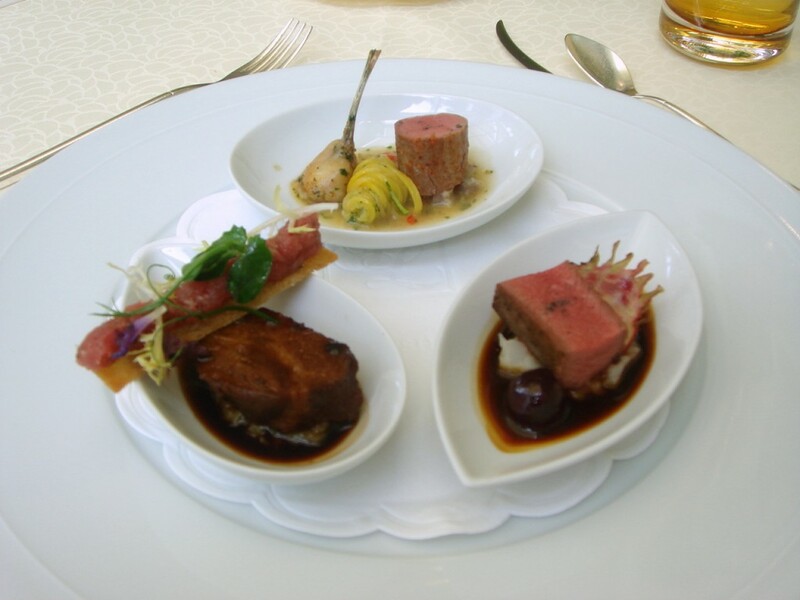 The first four courses consist of foie gras, fish, soups and meat, and within each you are provided with three dishes. This is followed by seven different miniature desserts to take the number up to19. 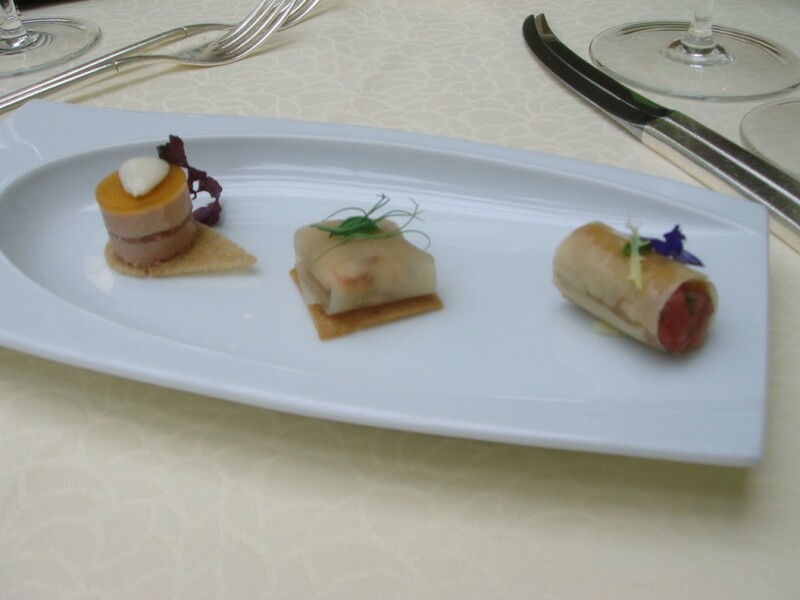 The amuse bouches (from left to right) were as follows: a terrine of foie gras with a jelly of peach; crab tartare; and a crispy connolo with tartare of veal. These were pleasant, particularly the foie gras with the peach jelly as the latter provided a lovely sweet contrast. However the crab tartare was disappointing. It was wrapped in a layer of pickled radish, the sourness overwhelmed the flavour of the crab so that you could barely taste it. The tartare was very tender and pleasant. 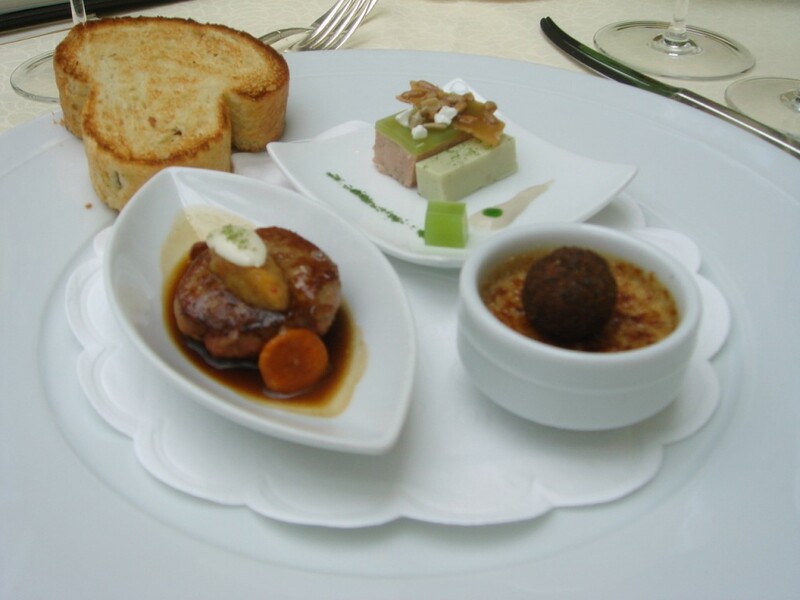 The trio of foie gras (from the top in a clockwise direction) were as follows: a pate of foie gras with green apple, yoghurt and sunflower seeds; a mousse of foie gras with praline of foie gras and pumpernickel; and pan fried foie gras with chanterelles and apricot chutney. Of the three, the mousse was the best with its intense flavour of foie gras. Its intensitfy was further enhanced by the heavy decadence of the praline, although the dish needed a little bit more acidity to cut through its richness. On the apple which accompanied the pate, this was very delicate and was therefore a little bland when eaten with the foie gras. As for the foie gras with chanterelles, the apricot chutney was drowned out by the accompanying sauce. There was therefore not enough acidity in the dish to slice through the liver’s richness. The sauce, with its spicy Asian overtones, was pleasant, but a little runny and could have done with further reduction for a better consistency. 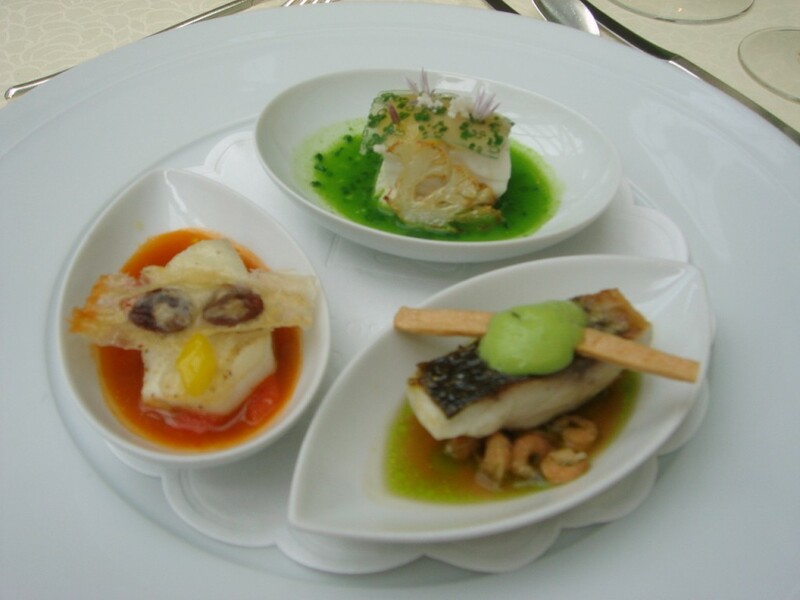 The fish dishes (from the top in a clockwise direction) included a fillet of turbot with smoked ox marrow, fumet of chives and cauliflower; grey mullet with a prawn and dill stew and cucumber foam; and pan fried anglerfish with caldeirada sauce (a type of Portugese fish few) and olive risotto. All the fish were cooked very well and remained moist and succulent. Particularly tasty was the mullet with its prawn and dill stew which was very aromatic. It had a lovely fish stock flavour. The ox marrow provided an interesting contrast with the turbot, and the caldeirada sauce provided a nice mix of Mediterranean flavours. 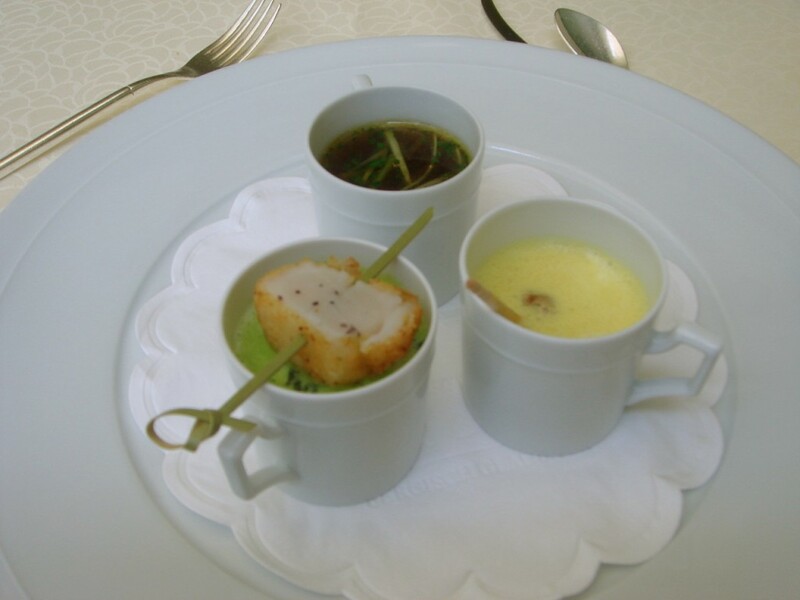 To the soups, and from the top in a clockwise direction, there was a consommé of duck; cappuccino of curry and lemongrass with sot l’y laisse (chicken oysters); and a cream of mint and peas with a baked scallop. As advised, I started with the cream of mint first. This was too hot and ended up scalding my tongue. More care could have been taken by the restaurant to serve this at the right temperature. Otherwise, it was very tasty. The meatiness of the accompanying scallop also proved. The cappuccino was very creamy, and pleasantly flavoured with curry and lemongrass, but it was the consommé of duck that was the standout. An intensely reduced duck stock, this was the best dish so far, although I found it a little odd that the restaurant had not skimmed all the residual fat off the top of the soup. On to the meats, and from the top in a clockwise direction, there was Iberico pork with frog’s legs, capers and anchovy jus; peppered saddle of venison, Jerusalem artichoke and beetroot; and braised cheek of veal with Barolo (a red wine) jus and tartare of veal. All the meats were of exceptional quality, well cooked and very tender. However, the pork, which was quite delicate, did not hold up against the heaviness of the capers and the anchovies. Its flavour was therefore lost when eaten with the accompanying sauce. The frog’s legs, fried in a light batter, were delicious and light. The venison and the veal worked well with their sauces, but I was disappointed to see the tartare of veal again. This had already been included as one of the amuse bouche selections (although as a canapé, it was in a roll and not on a piece of crostini). It perplexes me to see a three star Michelin restaurant choosing to recycle a ‘dish’ in this way without making any effort to alter its taste. For instance, with very little effort required,the inclusion of a few herbs would have changed the essence of this tartare. The desserts were a true delight. 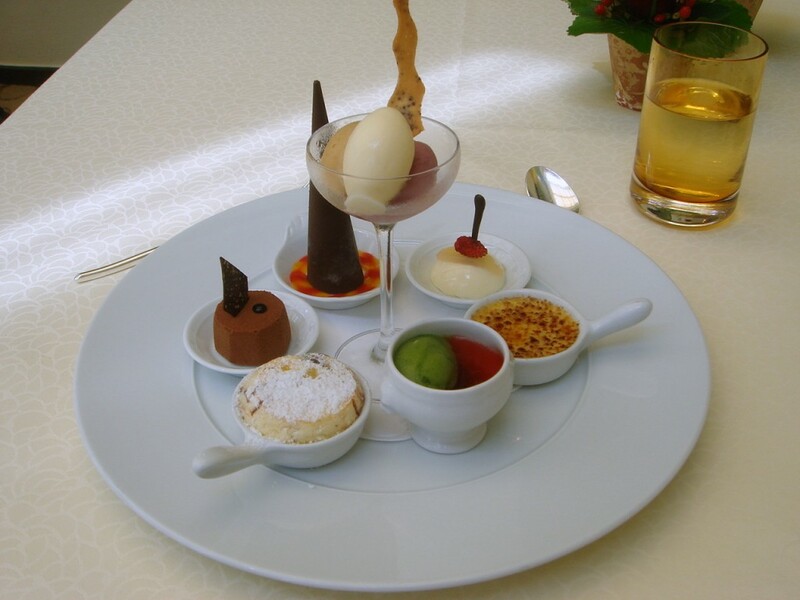 Starting with the conical shape and moving in a clockwise direction, there was a chocolate cone with a parfait of liquorice; mousse of elderflower blossoms; verveine crème brûlée; soup of bell pepper jelly with basil sorbet; pineapple soufflé with Tahitian vanilla; fondant of Jivara chocolate with rosemary; and a selection of ice creams (champagne sorbet, cherry with vermouth and caramel with muscovado). All the desserts were delicious. Particularly worthy of mention were the elderflower mousse and the creme brûlée, which were very aromatic. The bell pepper jelly and the basil sorbet showcased an interesting contrast between its two key ingredients, and the ice creams were divine, especially the cherry and vermouth which burst forth with lots of flavour. 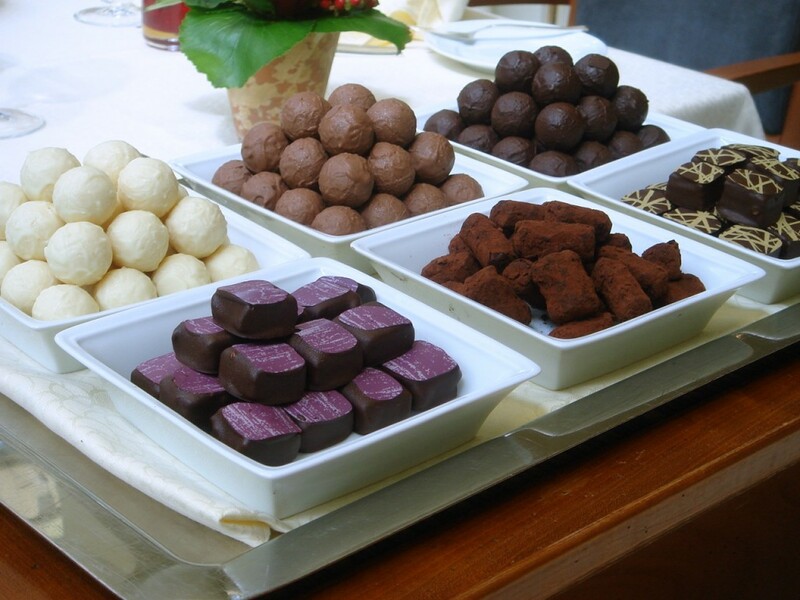 To finish, there was a lovely cherry puree with almond cream and almond jelly, and a selection of chocolates. The service was efficient, friendly and professional. There was also a diverse choice of breads, all of which were excellent. Most worthy of mention was the white with a crusty coating of almonds. It was soft in the middle and hard and crunchy on the outside. Overall this was an enjoyable meal and the desserts were excellent. But while it was nice, it was not an amazing dining experience. I had hoped that there would have been at least one dish that would have ‘wowed’ me, especially as Dieter Müller is a three star Michelin restaurant. There were lots of lovely flavours, the overall technique was good, and I really enjoyed the level of variety offered by the 19 courses. But nothing set my pulse racing. The menu felt restrained and a little uninspired. There were no new, untried flavours for me, no dish which I found particularly thought provoking or which served to tantalise my senses – nothing that induced gasps of awe. For me, a three star dining experience ought to be exciting – I want to sense passion in the food. While Dieter Müller serves excellent and accomplished food – and most patrons will no doubt enjoy eating there – unfortunately I found the meal a little lacklustre. It was nice, but it wasn’t a ‘wow’. In my opinion, this was at best a two star meal. I’ve had those kinds of dining experiences where everything is really pretty good but that “wow” factor is just missing; it’s unfortunate. Still, sounds like a nice dinner and looks like you are having so much fun on your holiday. It wasn’t the best meal for a three star.